We're about to let you into some secrets about an excellent red wine, a popular grape variety, an unusual winery, an inspiring man and aromatic oak barrels. 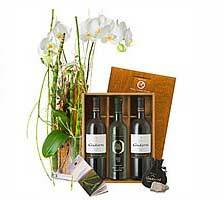 And there's more: you'll also find out a little about music and wine, as well as the ideal wine glasses and temperature. What wine goes with what music? 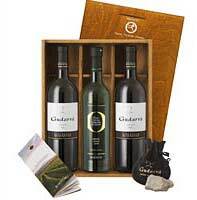 Gudarrà, a red wine originating from the Basilicata region of southern Italy, is an Aglianico del Vulture DOC. It comes from the highly-reputed Bisceglia winery and is distinguished by a complex and fascinating character, youthful vitality and genuine personality. 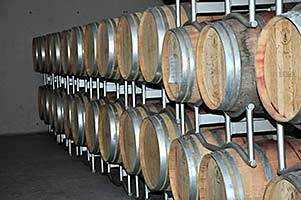 The wine ages for at least 12 months in new barriques and then for a minimum of a year in the bottle. With its ruby colour and purple reflections, it expresses its entire structure and impresses with its balance between tannins and velvety smoothness, fruit and spice. 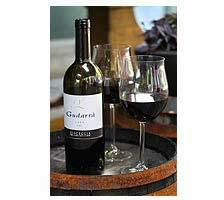 The Italian wine guide Gambero Rosso numbers Bisceglia among the best wineries in Italy and has now awarded its Gudarrà - Aglianico del Vulture 3 glasses, its highest rating, for the second time in a row. 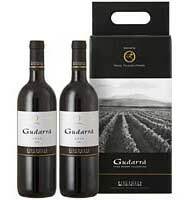 The US-American wine critic Robert M. Parker, whose wine ratings are highly influential internationally, also gives the Gudarrà an "excellent" score of 92 points out of 100. Fleurop flowers & red wine? You'll find the shop HERE. 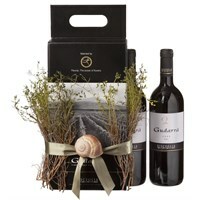 According to a Fleurop survey, 93% of respondents drink wine and 97% like to make a gift of it (70% even give it often). 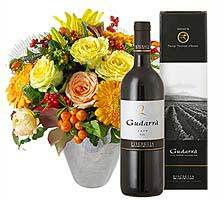 Flowers and wine? This combination is considered ideal: not only when you're invited out somewhere, but also for birthdays and saint's days, Christmas, anniversaries, as a thank you, to mark passing an exam, for engagements and weddings, and in business. 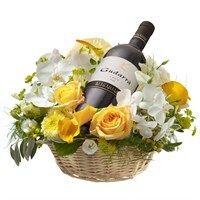 Flowers and wine are perceived as making a good pair. 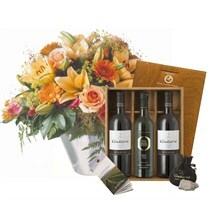 In addition, they are an opportunity to ALSO give women wine and men flowers. 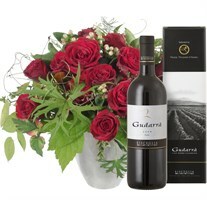 Original quotes: "Together with wine, I'm going to send a man a bouquet now and again in future. I've never done that before." Or: "Good idea. 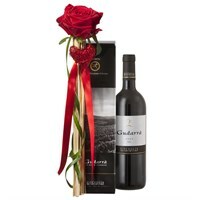 Then my wife won't just get flowers for our anniversary in future, she'll get wine as well, which will fortunately also be of some use to me." In short: you can score with flowers and wine. 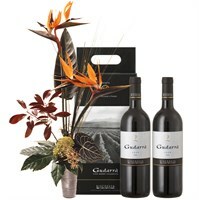 Gudarrà "Southern Italian Essence" gift set: contains 2 bottles of Gudarrà - Aglianico del Vulture DOC red wine (2 x 75 cl), 1 bottle of exquisite, cold-pressed extra virgin olive oil (50 cl) and a Monte Vulture volcanic rock in an elegant jewellery bag. Fleurop flowers and red wine? You'll find the shop HERE. "Gudarrà" isn't an invented word. It comes from the dialect spoken in the town of Lavello and means something like "You will enjoy it!" (in the written language: godrà). To keep this promise, the principal feature of this wine is its quality: in terms of the position of the majestic vineyards, the excellent grape variety and the processing of the carefully hand-picked grapes. All of these help to explain why the wine carries the DOC (Denominazione di Origine Controllata) quality seal. There are strict rules for DOC wines. 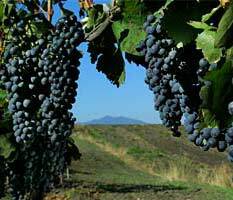 For example, it is not permitted to irrigate the Aglianico grapes used for this wine, which has implications for the harvest. 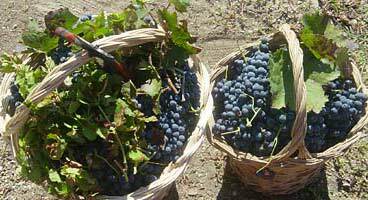 While up to two kilos of grapes per square metre can be grown with other vines, just 600 grammes or so are picked from those of the Aglianico del Vulture variety. 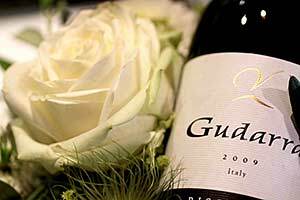 The wine is therefore stronger and more concentrated - it explains why the name "Gudarrà" is more than just a name. 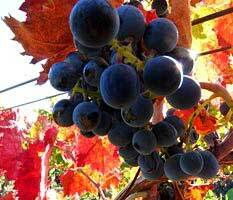 The native grape variety Aglianico is an old one, brought to Italy by the Greeks in about the 5th century BC. Wine was part of everyday culture for the Greeks even in those days, so they introduced viticulture to their new settlements. 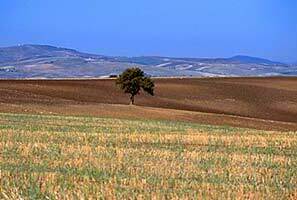 They found ideal conditions particularly in the south of the Italian peninsula - Campania, Puglia and Basilicata. They called the area Oenotria ("Wine Country"). In the last few decades, the Aglianico vine has developed into one of the most sought-after in the entire south. It is also being increasingly discovered in other countries. 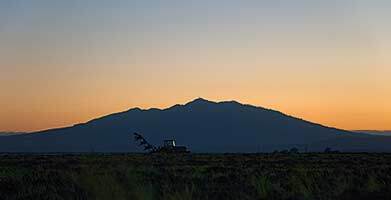 It prefers volcanic soil and a Mediterranean climate: mild winters, hot summers and wide temperature fluctuations which favour richly coloured grapes and complex wine. 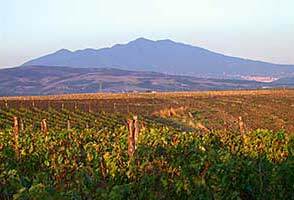 It's no wonder that the best wines come from the slopes of Monte Vulture, an extinct volcano in northern Basilicata. 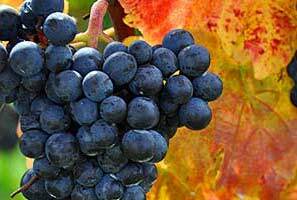 Wine connoisseurs call Aglianico del Vulture wines the Barolo of the South. 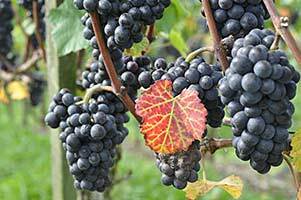 And we are even of the opinion that the Barolo is out in the cold compared to our Gudarrà - Aglianico del Vulture. Fleurop's Gudarrà - Aglianico del Vulture comes from the dynamic Azienda Bisceglia in Basilicata. 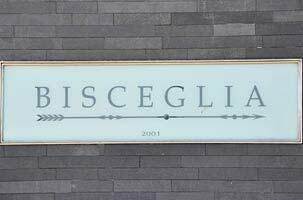 It was founded in 2001 by Mario Bisceglia and produces top-class wines of world-beating stature. 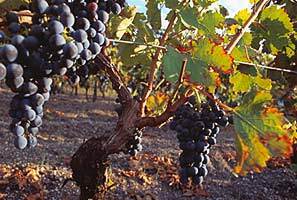 They are all grown according to organic guidelines and impress with their structure, minerality and accessible, soft tannin. The international trade press spares no superlatives in describing the outstanding quality and sensational rise of this winery. And the Italian wine guide "Gambero Rosso" even numbers Bisceglia among the best wineries in Italy. 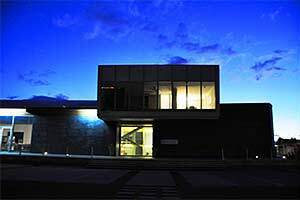 The winery was designed by star architects Hikaru Mori and Domenico Santomauro. 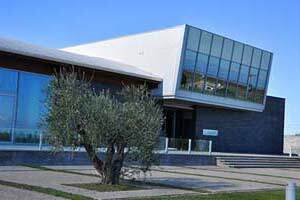 Today, the aesthetic structure unites wine culture with a Mediterranean lifestyle and offers not only an exemplary infrastructure for cellar work, but also room for the Jazz Club Vulcano Vini. 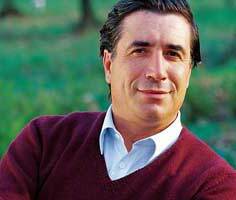 The proprietor of the winery is called Mario Bisceglia. 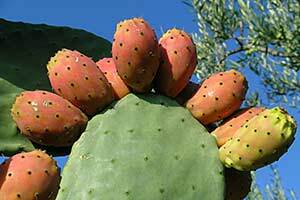 He was born and grew up in Basilicata and is therefore deeply rooted in this region. His path and his stellar career took him abroad and then back to his birthplace. He is now well on the way to making Vulture one of the best addresses for excellent wines and is incredibly proud when he finds them in Zurich, London, Beijing and New York. But how did the manager and marketing professional come to own a winery? "It happened in New York," recalls Mario Bisceglia. "I was having dinner at Le Cirque and tasted an Aglianico del Vulture there. The wine suddenly reminded me of home. I saw the familiar countryside before my eyes, I breathed the familiar scents, and just felt I wanted to introduce as many people as possible to the Vulture area." This emotion-driven project arose entirely by instinct - a project that is now on a solid footing with products that Mario Bisceglia describes as "the essence of southern Italy". And why did Bisceglia establish a jazz club in his cellar? 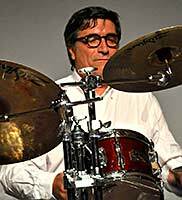 "I've been a pretty passable drummer since my childhood," replies Bisceglia. "But apart from that, I think wine and jazz are linked not just by joie de vivre, but also by the enthusiasm, commitment, heart's blood and huge professionalism they demand." You may have seen the word "barrique" on wine bottles before. It means that the wine was aged in an oak barrel. Gudarrà matures for at least 12 months in new barriques before being bottled. 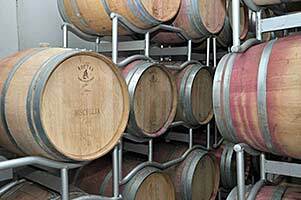 The word "barrique" for an oak barrel comes from the Gascon "barrica" for a barrel with a capacity of 225 litres. This measure came from the weight of a barrel that a dock worker could stow manually when empty: 45 kg. However, there are oak barrels and oak barrels. 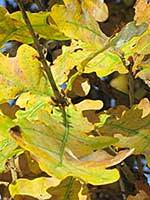 The type of oak has a major influence on the way the wine matures. 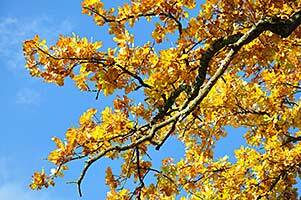 In France, European oak or sessile oak is mostly used to make the barrels, in the USA American white oak is more common. 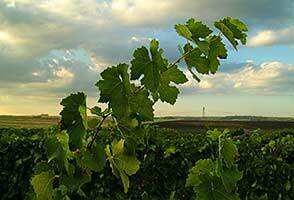 And as with vineyards, every forest has a different terroir. The climate, type of soil, age of trees and many other components influence the quality of the oak wood and consequently the taste of the wine. There are several stories current about the discovery of the barrique method. One of them tells how, in the early 19th century, vintner Louis-Gaspard Estournel from Saint-Estèphe near Bordeaux found that some lots of wine that had been shipped to India in oak barrels and not sold had improved vastly when they returned home. He marked them with an "R" for "Retour des Indes" and sold them at ever higher prices as word of their quality spread. He did not know the reason, and decided in the end to send all his wines on a sea voyage in wooden barrels before selling them. Nowadays, of course, we know that oak barrels are used for storage to round off the spectrum of flavours with components from the wood and that Estournel's wines were not improved so much by going for a sail. Aging a wine in barriques takes a great deal of knowledge, experience and care. Because the quality of the wine is just as crucial for a good barrique-aged wine as the wooden barrel. For a wine barrel, a major role is played by the toasting, in other words, the degree of internal charring of the staves. The main reason for barrique aging, however, is the micro-oxygenation (i. e. minimal exchange of air) and also the concentration of the wine. 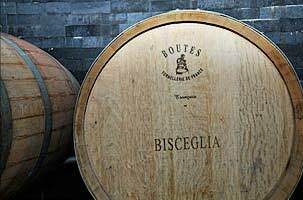 At Bisceglia, for example, 5-8 litres of wine per barrel (around 4000 litres for the whole cellar) evaporate per annum during aging in oak barrels. That gives the wine even more body. 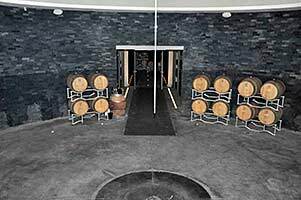 Also: the newer the barrel, the greater its influence on the wine, because barriques lose their aroma from use to use. The Gudarrà is matured only in new barriques. 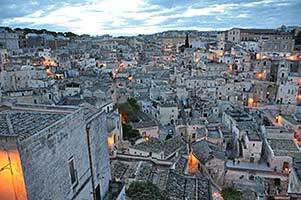 There's a lot to Basilicata, particularly the town of Matera in the hills with its extraordinary old quarter and ancient troglodyte settlements known as "Sassi". 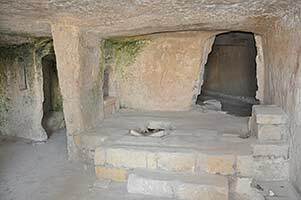 They're like a gigantic sculpture: with cave dwellings piled on one another, cellars, and churches cut into the rock that go deep into the earth and are connected by winding lanes and steep steps. 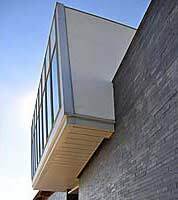 The roofs were often used as floors for the dwellings above or as paths. In addition, remains can be seen of a sophisticated well and irrigation system from the Bronze Age. Up to 1952, around 15,000 residents lived in the Sassi under appalling hygiene conditions. They were then evacuated and rehoused in new parts of the town. Fortunately, the value of the Sassi was appreciated once more at the end of the 1980s and they were restored. 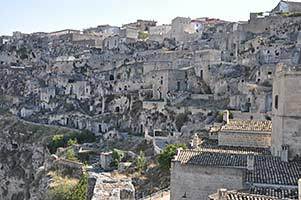 This, in turn, brought UNESCO onto the scene: in 1993, they placed the Sassi of Matera under protection as a monument and declared them a World Cultural Heritage site. 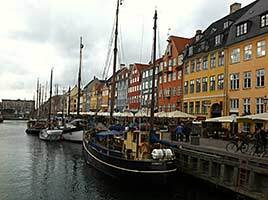 Today, they deservedly fascinate not only researchers and artists, but also countless tourists from all over the world. Do you like wine? And music? Shut your eyes, imagine one of your favourite melodies and think about what wine you would most like to drink with it or, conversely, what song you would like to hear to which wine. You'll soon realise that there are definite differences. Well, you just wouldn't drink the same wine to "Eine kleine Nachtmusik" as you would to "Knocking on Heaven's Door". Specialists have pondered the matter, too: for example, a Scottish research team that devoted a whole study to the subject in collaboration with a wine producer and the Department of Psychology at Heriot-Watt University in Edinburgh. So it's not surprising that Mario Bisceglia also combines wine with music. With the Aglianico? Jazz goes with that one, of course, but it's not the only style. 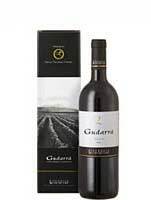 Because a red wine with a lot of character like the Gudarrà is also well matched with rock, pop, soul, folk and classical music. 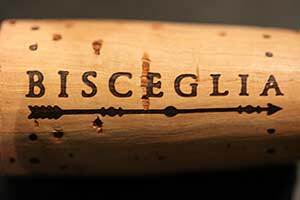 The only condition is possibly that the pieces have to demonstrate just as much personality as this elegant, but full-bodied red wine from the House of Bisceglia. Serve good wines in colourless and odourless wine glasses if possible. A Bordeaux glass is best suited to the Gudarrà because the glass tapers towards the top and the nose, strength and flavours are therefore concentrated. The long stem is important to keep your nose far enough away from your hand: even the normal smell of your skin can influence the wine's bouquet. 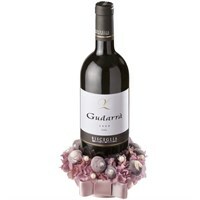 While white and sparkling wines are uncorked immediately before serving, mature red wines like the Gudarrà should be opened at least an hour before drinking. 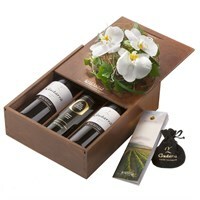 The bouquet and flavour develop better when enriched with oxygen. If there isn't enough time for that, the wine can also be poured carefully into a round-bellied carafe shortly before serving. Experts recommend that sparkling, white, rosé and sweet wines should be served from the refrigerator and red wines at a maximum of 18 degrees Celsius. In general, you should serve wines slightly too cold, they will soon warm up in the glass. 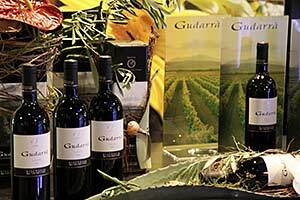 And another thing: our Gudarrà goes perfectly with fine beef, lamb or game. However, it also knocks your socks off teamed with flavourful pasta dishes and mature cheeses such as Pecorino, Parmesan or Gruyère. Did you sweat over geometry at school? Then you definitely won't have forgotten Pythagoras' theorem: a2 + b2 = c2. But did you know that Pythagoras also designed a mysterious drinking vessel? There's an amusing story behind it. Nowadays, it's considered barbaric to mix a fine red wine with water. In days of old it was the other way round. Because the Ancient Greeks, who as we know brought the Aglianico grape to southern Italy, always mixed their wine with water. They knew that an excess of wine had an intoxicating effect and therefore only used it undiluted in small quantities and as libations. Naturally, not all Greeks followed this unwritten rule. Simple people in particular secretly preferred to enjoy their wine "neat". 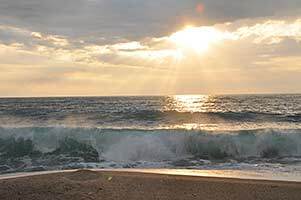 That included the workers who were employed by the mathematician and philosopher Pythagoras in building the water supply for the island of Samos and were granted a cup of wine every day. Pythagoras quickly created a vessel that is also known to this day as the "greedy cup". It forced the user to drink in moderation, because its design only allows it to be filled up to a certain level. If this rule was observed, the drinker could enjoy his wine in peace. But if he was greedy and poured more in, the entire contents ran out of the bottom of the cup. An important demonstration of the fact that wine was known to a wide variety of cultures very early in history is to be found in its name, which is the same or similar in many languages. For example, the Arabic wayn, the Latin vinum and the Greek oínos are related, although they do not allow any conclusions as to which language they are originally derived from. The High German word Wein, the French, Swedish, Norwegian and Danish term vin, the Italian vino and the English wine also sound similar. And even the Welsh word gwin and the Irish word fion come from the same root. Experts assume, however, that both the Germans and the Celts were introduced to wine by the Romans, and therefore adopted the Latin term. The name for wine pased from the Germans to the Slavs and Baltic races through later trade relationships, which also explains why wine is called vinó in Russian, vynas in Lithuanian and vins in Latvian.